After getting the Subaru all rigged up for the road with a fold out bed and other accessories (Check it out here), we took it out to Black Rock City for our annual pilgrimage to Burning Man. 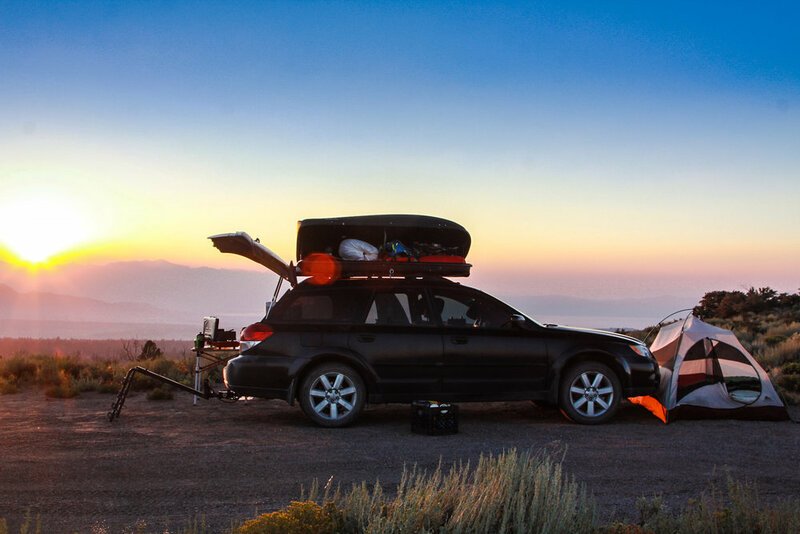 We don’t stay in the Subaru at Burning Man. We build a hexayurt, although we have tried the car and it was miserable. (More info on hexayurts here) We’ve only traveled to BM from California and Washington, so coming from New Mexico was going to be a mission. We figured we would break it up into a road trip. So all you New Mexico burners out there, we found a pretty awesome and fun route with multiple stopovers on your way to BRC. Our first stop was a five hour cruise over to Sedona. Being our first time in Sedona, we had no idea what to do. So, we headed to the Dry Creek Area for some exploration. We wanted to see Devil’s Bridge, but we knew it would be swarmed with people since it is one of the top hikes and easiest in Sedona. Plus, it has jeep trail access. So you already know the Pink Jeeps are blowing this spot up. So, we explored the surrounding exotic red rock territory until sunset and then headed up to Devils Bridge after sunset. Per usual, on our way up everyone was heading down, we got to the bridge and had it to ourselves once the stars were coming out. We shot a few photos, watched the stars, and had a drink. We were getting very comfortable until we saw a few scorpions, so we decided to head down. We drove to Forest Road 525, off HW-89, for some free camping. We drove past the first few occupied pull offs and found our own exclusive spot and set up for the night. We woke up, cooked breakfast, and headed out towards our next destination. We made the long haul from Sedona to the Trona Pinnacles in Death Valley. It’s best to arrive at the Trona Pinnacles later in the day, around sunset, because the late summer daytime temperatures are boiling. It was about 102 degrees at 7pm, when we pulled up. We braved the heat and shot some magic hour photos and set up the rig for another night. Thankfully, for us, it cooled down at night and we slept without the rainfly to have an amazing star show that night. If you’ve never heard of the Trona Pinnacles, it's a pretty cool place to stop over for a night of camping in Death Valley. 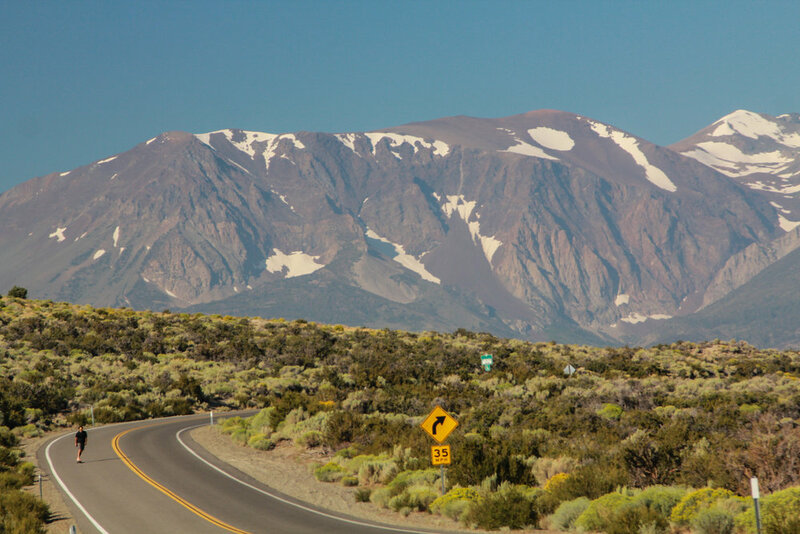 We woke up and headed for HWY 385 that heads up the heart of the Sierra Nevada. This is some of my favorite stretches of highway, for life on the road. There are so many amazing and scenic spots throughout this area. We stopped in Lone Pine for some supplies. If you have extra time, you must camp at Alabama Hills, outside of Lone Pine, it’s one of our all time favorite campsites. We headed up the 395 for some hot spring action. There are plenty of hot springs out here, you just have to find them and it’s not very hard. Whitmore Springs area is just one area with multiple hotsprings, some you can camp near. After soaking in three different tubs in the area, we found a campsite around June Lake. We stayed at a free site that wasn't anything special, but it was free and in route! The next morning and headed towards Yosemite. We’ve been to Yosemite many times, but we've never been to Yosemite from the East Entrance. 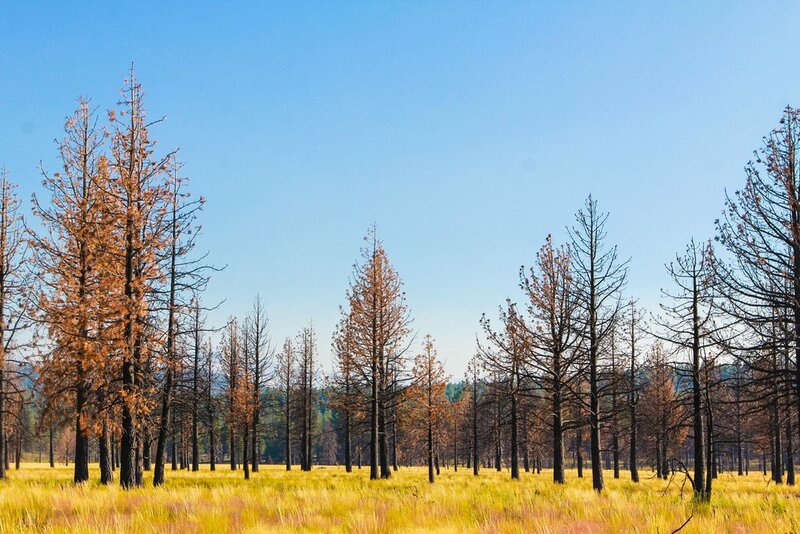 We thought it would be a better to head to Tuolumne Meadows during peak season since the Valley is a nightmare in late August. Unfortunately for us, there was some serious smoke from a forest fire and we had to bail on hiking Clouds Rest. So, we headed to the info center to get some tips on where to find something that would have better visibility. We debated an overnight, but decided with all the smoke we should just hit a day hike and get out of the smoked out valley. We chose Lembert Dome which ended up being a great hike considering the conditions and it was relatively short and easy for the awesome reward. 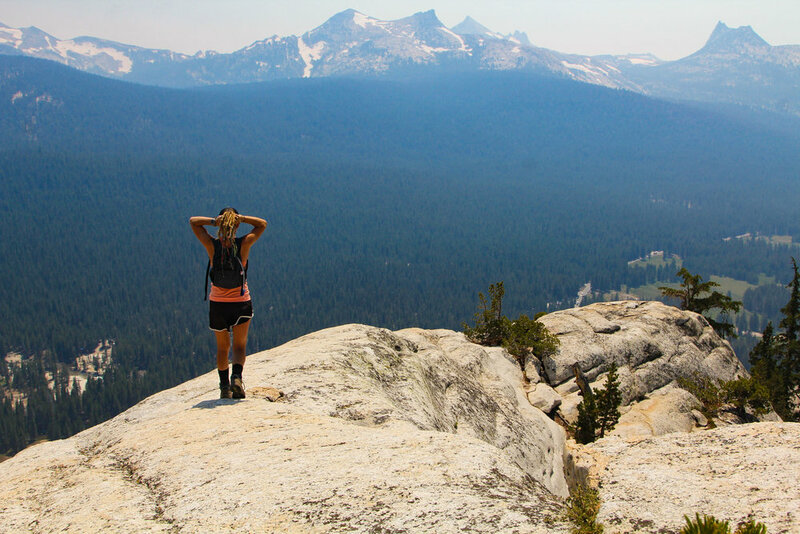 We were actually really stoked on Tuolumne Meadows, on the backside of Yosemite. It’s really nice with half the crowds and you are able to get an amazing perspective of the Yosemite Valley from fairly easy hikes, and roadside pullovers . 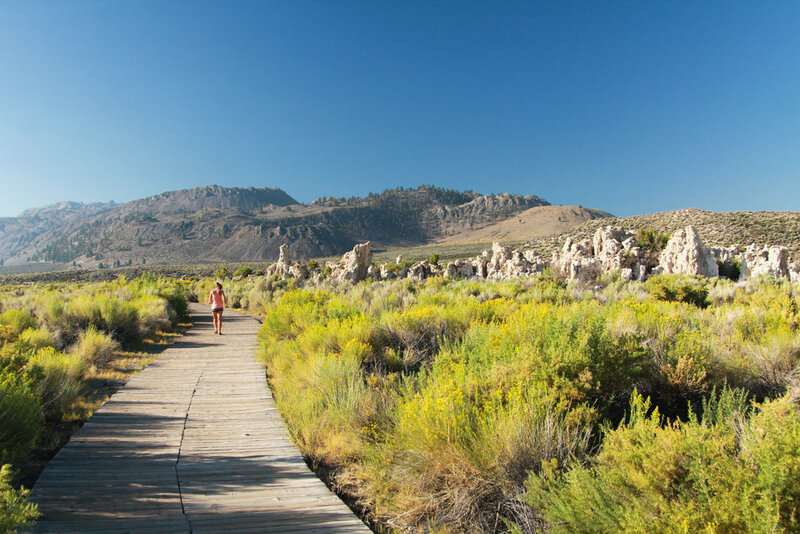 We headed out and talked with someone at the visitor center in Lee Vining that recommended Jeffery Pine Forest for a nice overnight camping stop over. After about and hour + of adventuring around this area on the dirt roads, thank god we were in the Subaru, we finally stumbled across one of our best campsites of the trip. We were able to get lucky and find a pretty rough road along a ridge to our own little hilltop camping spot. We set up and enjoyed a smoked out sunset cooked and slept in the car that night because it was a bit cold still in the high country. 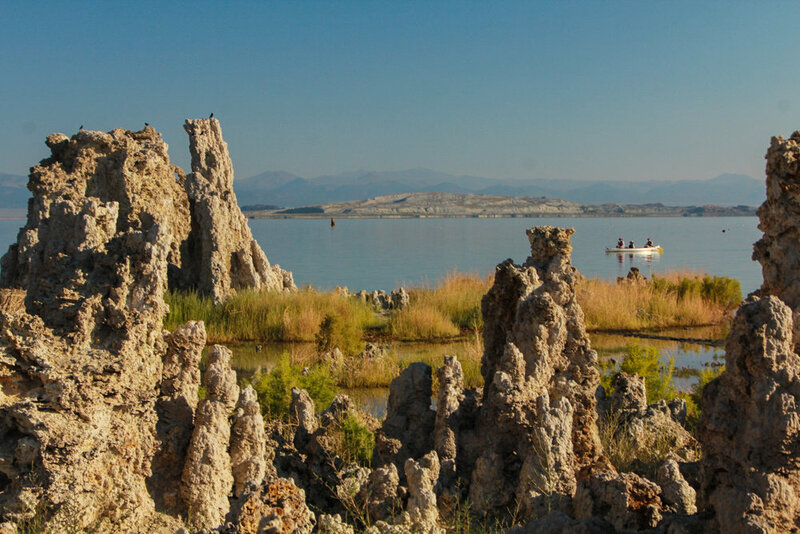 After our camp at Jeffery Pine, we headed down to Mono Lake to see the famous Tufa formations in the morning before a bunch of people showed up. There were some kayakers on the water, but there was no one walking around yet. 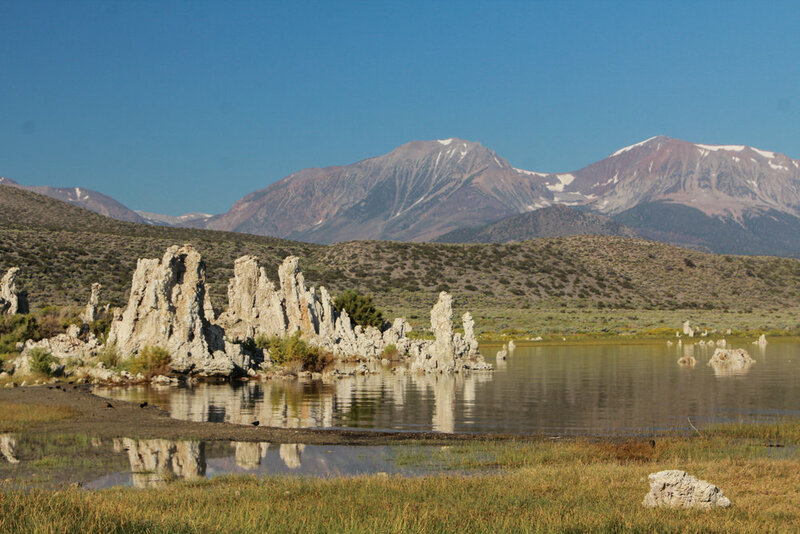 If you have not been to Mono Lake, this place is crazy. It's actually hard to explain, but it is worthy of taking 30-45 mins to pull over and check out how crazy the earth is. 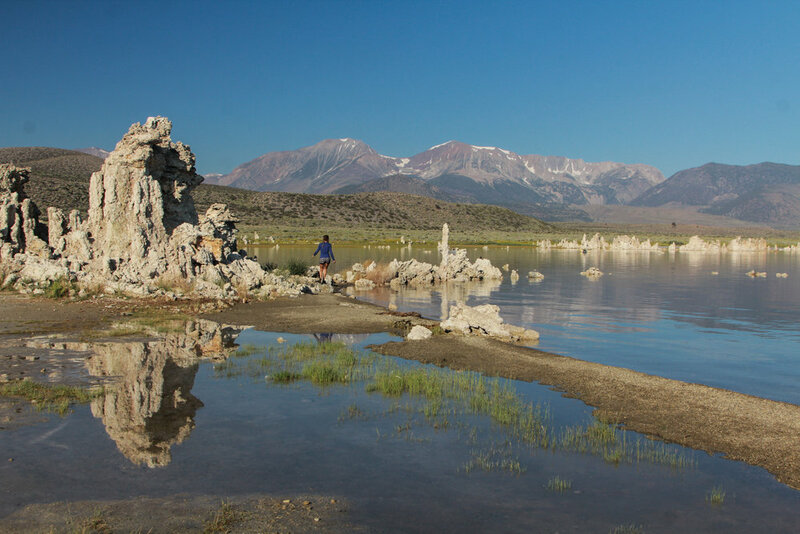 Although we missed both magic hour's at this spot, I am sure that Mono Lake would be pure magic for sunrise and sunset. After Mono Lake, we stopped at Panum Crater, after seeing signs for it exiting the South Tufa area of Mono Lake. So, we decided to take the dirt road and check it out. The trail head starts out on a rough pumice trail that leads to the rim. 0.2 miles of further hiking will take you to the spectacular obsidian core of the volcano that erupted over 600 years ago. Fun fact we learned on the trail, dependent on how rapid the cooling process is, lava becomes Pumice or Obsidian. It is crazy the cooling process can change the look and feel of a rock so significantly! We headed out that morning to soak in the Travertine Hot Springs. After a nice mud soak, we headed out to the Tahoe area to meet up with a good friend of ours. We had great timing, as we arrived he was at an art car fundraiser for Burning Man, so we got to get in the groove and even got our first gift at the event. From here, you could head to Reno and skip Tahoe however, we had to begin the prep for our camp “Camp Happy Hour” based in Auburn, California. So we headed out to Auburn to begin the prep and the final haul to the Playa.